"Publishers are supposed to stand between the public and awful novels and “inspirational” works." "But with almost 400,000 self-published books a year, the amount bought or preserved by libraries is going to be negligible. In the future, it will be like the vast majority of these books never existed." "Or maybe that’s true now. If an ebook is published in the wilderness and nobody reads it, does it still count as a book?" Trade published books are not necessarily going to be better edited than a good quality self-published book. Library users want the most popular books, not niche books. Librarians rely on certain sources (Library Journal, Publisher's Weekly, etc) for reviews to allow them to make book purchase choices. Librarians do not have the time or budget to evaluate quality individually, so a librarian is infinitely more likely to choose a trade published book which has been reviewed by a trusted source. Most of these sources do not deal with self-publishers (or only do so on an exploitative payment basis). These posts inspired the usual eye-rolling in self-published circles, but (ignoring the misplaced suggestion of self-pub = poor quality) their overall gist appears to me simple common sense. There are a lot of books out there, and librarians usually have a limited budget and even less time to spend. They're going to focus on popular, reviewed and 'trusted' books. I disagree, however, on the question of posterity. Print on demand and ebooks have completely altered the question of how long a book is remembered. Unless the book world goes through another revolution, every book I release will be available for as long as I allow it to be available and then it will linger on on pirate sites and eventually public domain. For as long as there is a version of the internet, my books will remain. I already have over ten releases. Each year (except for the ones where I am exceptionally slack), I will release a new book. Physical copies of my books are purchased by readers who particularly like my work (or just prefer to read from paper). Some of these will circulate to second hand book stores. Two of my books have finalled in 'creditable' awards. I am linked three times in Wikipedia, though probably don't quite meet the notability requirements to warrant a page of my own. I've never been reviewed by Library Journal or Publisher's Weekly and don't really expect to be. I have been reviewed by Sherwood Smith and Rachel Neumeier, and believe me, the Library Journal isn't going to make me squee nearly as much as the idea that People I Read Have Read Me. It's possible for any of my books - new or already released - to become a break out hit, or at least a minor success, but even if I simply continue on at my mildly improving growth rate, I have still made tens of thousands of sales. There are people who consider me an auto-buy author, which (along with re-reading) is one of the biggest compliments a writer can have. For the kid I was, growing up in a family where you got books from the library or for your birthday or not at all, a writer not 'preserved' by a library would simply not exist. But that kid still would have grown up, and transitioned to second hand stores, and then the luxury of buying brand new books on the day of release - sometimes in hardback! And that was back then. If I was myself, and ten, in 2013, that once-a-year gift would have been an ereader, and I would be fully appreciating Project Gutenberg, and the plethora of free ebooks used as promotional tools by publishers, and I would shamelessly download pirated books because, after all, it was the books which were my lifeblood, and libraries only the intravenous system which delivered them. 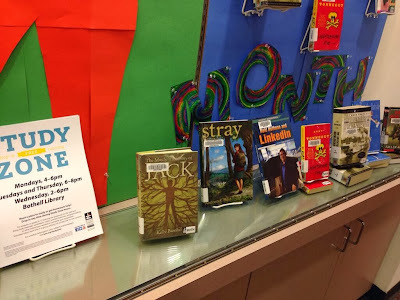 I started this post because Flannery, Readventurer Extraordinaire, excitedly tweeted to me that she'd seen Stray sitting out on display at her local library. In the nearly four years since I first published a book, this is the first - the very first - time I've had an "in the wild" sighting of any of my books. I was so excited I demanded asked her to go take me a photo. So there we have it: my book in a library, ready to give some unsuspecting teen what Norton and McCaffrey and McKinley and Jones gave me. 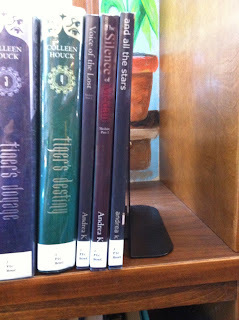 Flannery checked the library system, and there are five copies of each of the Touchstone books, and four of And All the Stars. King County Library System is apparently the busiest in the US, and evidently has managed to spare a little bit of time and budget for the occasional self-publisher. [I suspect it was making the Cybils finals which may have triggered the purchase - that definitely did raise my profile generally.] What a lovely picture that is, Stray being a real book and not looking out of place at all. My excitement demonstrates that libraries are still an important part of the system, but they're not the only part of the system. My posterity's doing fine, thanks very much. Gosh I write skinny books. At the beginning of the year I noted that I'd hit 10,000 sales by the end of 2012. Prompted by Patty Jansen's informative post, I've updated my figures for those interested in self-pub stats. I've been totting up last year's figures for my taxes (which run from 1 July to 30 June in Australia) and my (gross) royalty income looks to be around $16,600. This is less than last financial year, despite what the sales numbers suggest - but mainly because Amazon pays by cheque about two months after you earn the money. 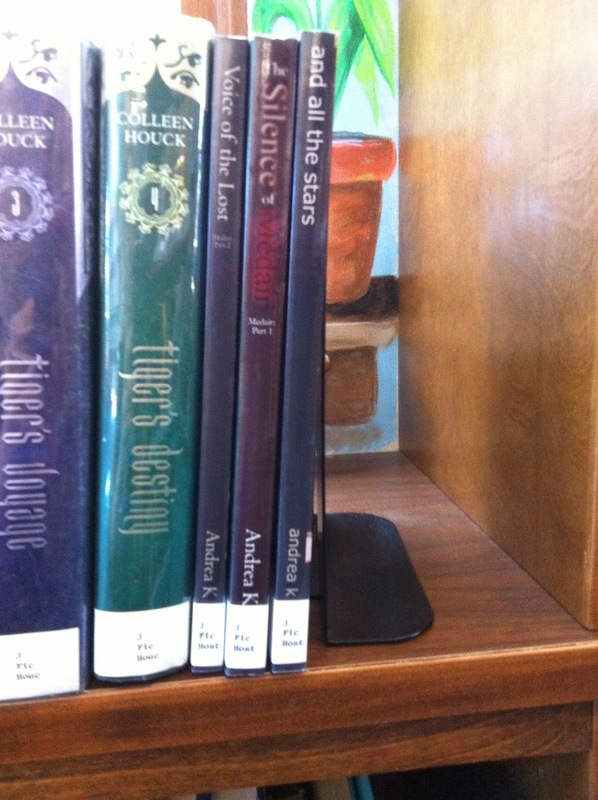 As you can see, The Touchstone Trilogy is still by far my most popular books. Partly that's the power of series and first book freebies, but it's also simply very popular and gets very good word of mouth. Stained Glass Monsters remains my least successful (ironic, given it's one of my favourites). It wasn't until I'd totted these figures up that I could see that both And All the Stars and Hunting had performed quite well for stand alones. Their numbers will no doubt drop off now we're well past their release dates, but I'd expect to continue to sell several hundred each year. Like most self-publishers, Amazon is by far my best outlet. Both Barnes & Noble and Apple improved this past year as a direct result of Bookbub, which is a cheap books notification service which has been one of the few effective promotion tools lately. The big money in self-publishing tends to be in certain genres, and also in writing series. Unfortunately I don't think I have the writing skills/style to do well in the big money genres (thrillers, romance and erotica can be difficult to write! ), but I am at least writing series books this year. Typically, I'm writing the beginnings of three series at once (while finishing off Bones) and the things I'm interested in writing tend to not match up with the types of books which become immensely popular.